Fixed income markets in India have evolved steadily over the past decade. At end of 2017, income funds (including semi-, mid- and long-duration) comprised 82% of the assets under management (AUM) of open-ended AUM of debt mutual funds (excluding liquid funds), while credit or accrual funds comprised 18%. Share of credit funds in this pie was in mid-single digits 5 years ago. While the overall AUM under fixed-income products of mutual funds may still appear small in comparison to bank deposits (which are five times larger), it has grown at a CAGR of nearly 21% in the last 5 years, according to Association of Mutual Funds of India. Historically, the Indian bond market has been concentrated in the high-grade segment comprising AAA corporates and a few high-quality AA+ issuers. Even as deepening in the bond markets has been gradual, market breadth has been steadily widening in recent years. This has been reflected in the growing issuance volumes in mid- to lower-end rating categories, that is, AA and AA– to A–. Their growing acceptability is triggering higher issuance volumes in these categories. Widening in the markets due to higher appetite for credit securities has been aided by an increase in the number of participants and newer investor classes. The other important factor has been the search for ‘returns’ as ‘yields’ in general have seen a secular decline over the last decade. Historically, there have been many misconceptions on ‘credit’. Earlier, all securities below AAA were referred to as ‘credit’. With widening in the markets, most AA+ issuers are now being clubbed with AAA in the definition of high grade. The other popular misconception is to refer to ‘credit’ and ‘credit funds’ as having a high ‘default risk’. As the data of issuers with rating agencies has grown, credit analytics can offer inputs on rating migration, credit default and eventual losses over the life cycle of the ratings. Rating migration and credit default statistics now offer a fair data on default probabilities. 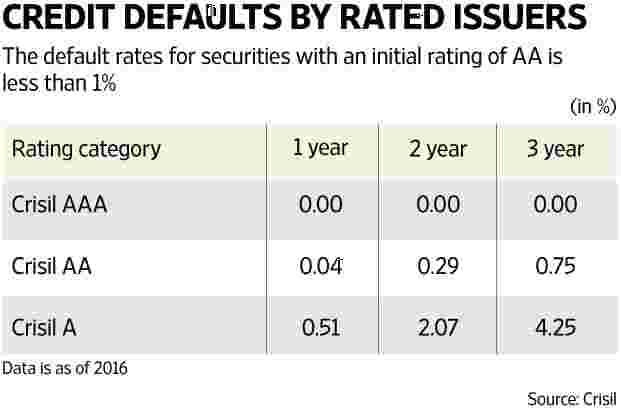 Credit default data, compiled by Crisil for its rated issuers as of 2016, shows that on a 1-, 2- and 3-year basis, the default rates for securities with an initial rating of Crisil AA is less than 1%. For A-rated securities, on a 3-year basis it is slightly elevated at 4.25%. But it also needs to be borne in mind that this number is at the bottom of the cycle, given that 2013-16 saw the worst part of the credit cycle. Also, the 1-year transition rates for short-term and long-term ratings over 1988-2016 reflect remarkable stability for the A- and higher-rated securities. For instance, of all the issuers with an initial rating of A, less than 8% migrated to BBB or lower, including 2% that moved into BB or lower. There are two notable developments in the further institutionalisation of Indian fixed-income securities market, more specifically the credit markets. The first is Insolvency and Bankruptcy Code (IBC), 2016. This is India’s first bankruptcy law and seeks to provide a formal mechanism for creditors (operational and lenders) for resolving insolvencies. The new law seeks to quickly admit companies into the process and offers a timebound framework to resolve, failing which the issuer goes into liquidation. The other has been the setting up of Asset Reconstruction Companies, or ARCs. From fixed-income markets’ point of view, ARCs are crucial in establishing a price for viable assets. Lenders and investors can now sell their holdings in troubled assets to such ARCs, and realise an immediate value for their assets. With limited issuance volumes in the past among AA- and A-rated issuers, there was no representative spreads for these categories. This has started changing as issuance volumes have been rising in the mid- and lower-rated categories in the last 2-3 years. With a good issuance quantum in these categories, the spreads for A and AA issuers can now be considered fairly representative. Availability of credit spreads is helping price risk more appropriately. The performance of credit funds has been above average. On a 1- and 3-year basis, the benchmark index has returned 4.71% and 8.70% respectively. Category averages over the same period were 7.19% and 8.72%, respectively (as measured on direct plans for a peer group of 23 credit funds). Thus, credit funds have beaten the benchmark in short- and medium-terms. In contrast, short-maturity funds (80-85% of AAA securities) have underperformed credit funds, returning 5.86% and 7.84% over the 1- and 3-year periods (benchmark and internal data). Given the setting up of credit framework and gradual institutionalisation of fixed-income markets, specifically on credit, we see room for credit funds to grow in the fixed income business. As economic activity picks up and issuance volumes grow, there is opportunity for credit funds to grow and become a meaningful part of asset allocation. Kumaresh Ramakrishnan is head of fixed income at DHFL Pramerica Asset Managers Pvt. Ltd.